Join the Get-Organized Challenge and Giveaway! Welcome to the third day of 31 Days of Simple Organization! To read all of the posts in order, visit the Overview Page. Having someone who is willing to help you make good decisions as you organize your possessions can be invaluable. The problem is that finding a friend who is willing – and able – to help with the task isn’t easy. And you know what else? 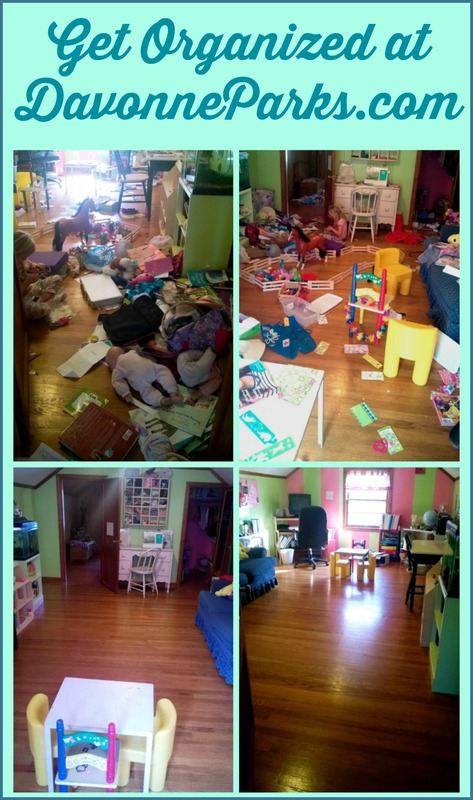 As an organizer, I love to help other people with their clutter challenges. But unfortunately I can’t go into all of your houses to help you as much as I’d like to. So after months of pondering those two problems, and then even more time of ironing out the details, I’m finally ready to share a solution that I think you and I are both going to absolutely love! Today, I’m launching a brand-new Get Organized challenge! In this challenge, I’ll work as your virtual organizer by offering personalized tips, suggestions, and fun rewards. Best of all, everything is completely FREE! All you need to do to join the challenge is e-mail Davonne@DavonneParks.com a photo of one problem area in your home along with a short list of concerns regarding that area! Within about 72 hours from receiving your initial e-mail, I’ll reply with encouragement and specific action steps you can take to successfully organize your space. Today’s Simple Organization Challenge: Find an organizational accountability partner. Whether it’s me, a local friend, or someone living within your household, allow someone to inspire and encourage you to organize your home. I really like some of your specific tips, as well as the before and after photos. Thanks for sharing. Absolutely, Zumrad! It’s never too late to organize your home. So glad you purchased the bundle! I just sent you an email invitation from Facebook to join the secret challenge on Facebook. Please feel free to email me at Davonne@DavonneParks.com with any questions. I also purchased your ebook in the bundle and would like to start this challenge. Can I join the FB group too? I’d love to have you join the group, Sarah! You should have an invitation from Facebook directly in your email inbox. So glad you’re getting motivated and working hard! I’m so sorry for your pain, Diane. It sounds like your friend coming to help with be just what both of you need! I also got the bundle and I have to say, I loved your book. Now I have the problem of putting your wonderful words into action. I’m not great at that. So, can I join this challenge and send you the photos of my worst room? Thanx. Thais. Thank you, Thais, I’m glad you enjoyed my eBook! Absolutely send photos over – I’d love to give you some tips!